On the 5th September 2015, the Copeland Island swim was run in memory of Sheena Patterson, who was the first female to swim the race. It was an important swim for me, for many reasons, my grandfather won this race in 1935, and my brother had swam it in 1998, and I paddled beside him in this swim. At that stage, I couldn't fathom why anyone would want to swim in water of that temperature, in the jellies and the tidal flow. Since I have taken up sea swimming, I had wanted to swim this course, because of the temperature, the jellies and the tide. Sadly no-one had been organising the race in the last few years, but I had heard that Sheena was talking to the NC pilots about running the race last year, and I wanted in. Sadly Sheena didn't get to organise this race, but we swam it for her. Arriving in Donaghadee that morning, the sun was shining, and when I came to the shore, it was obvious that the wind would be behind us, giving a bit of chop, perfect, not an easy swim, but not too tough either. We met up in Pier 36 and when I arrived it was full of swimmers ensuring they had sufficient nutrition for the swim, the Channel pilots and safety crew were there, there was a quiet chat, as people met old and new friends. 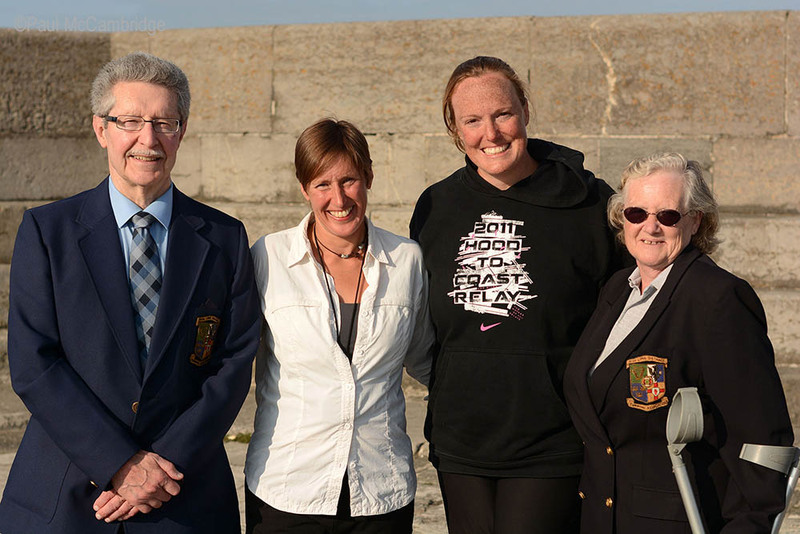 Sheena's family were there too, and it was good to meet them before the swim. The brief for the race was simple, head directly south before the tidal flow starts to run, and then turn East towards the harbour, it's not a race, it's a fun swim to remember Sheena. After changing for the swim, we were led along the pier to the boat by a bagpiper, which made us all smile. We boarded the boat, and there was more quiet chat on the way out, everyone was just there to have fun. Quinton pointed out the buoys and the sighting points as we went. When we got to Chapel Bay, Mo got on to the island to lay some flowers for Sheena. After turning East at the buoy, the wind and swell was behind us, and there were a good few fun drops as we swam to the harbour. The water was cool, and a few of us cramped up, but no major difficulties. A lions mane passed right under me, but I missed the tentacles, not all were so lucky.We finished at the harbour, Sheena's daughter's Caroline and Anne-Louise on the steps greeting all the swimmers back. Everyone climbed out of the water with big smiles. We all went back to Pier 36 for soup, sandwiches and some more chat. Despite it not being a race, there were some fabulous new cups as perpetual Trophies for Sabrina and Ned. Thanks to all who organised, pddled, crewed on boats, piped, and supported the swim. It was the most fun swim I've had, I wish we could bottle the atmosphere of the day, and have it at every swim. It was a great swim in memory of Sheena, challenging and fun, the best way to remember her was a day full of good feeling, and big smiles all round.